I just finished big improvements in the contour detection of the GRIBs. The performances are now correct (a few milliseconds per GRIB layer, for a full Pacific GRIB 2 degrees by 2 degrees). Now the contour detection can be part of a GRIB Animation. In addition, there are now new check boxes to show and hide already computed contour lines, just like for the faxes. 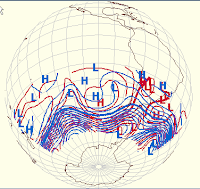 The picture shows PRMSL and 500HGT contours detected in a South Pacific GRIB. Notice that there is now an option to show only the detected contours (with no wind or other GRIB data).